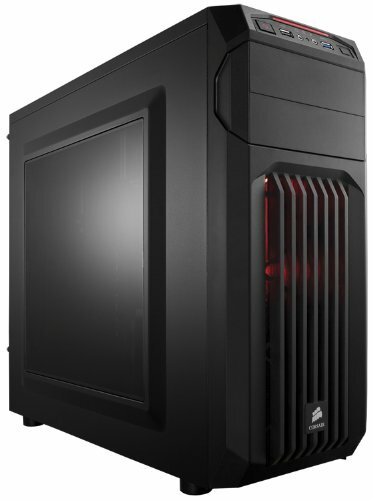 Corsair Carbide Series SPEC-01 Red LED Mid-Tower Gaming Case is proof that great looks, smart design and durable construction. 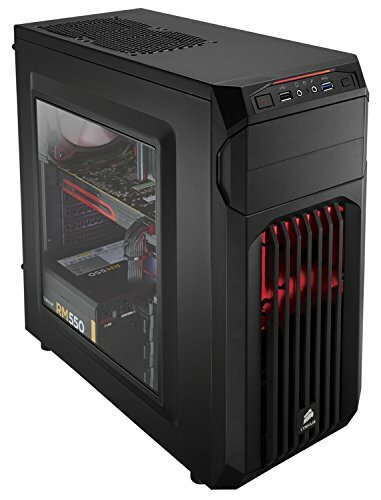 You get aggressive styling, a huge side panel window for admiring your components and an LED-lit front intake fan that draws cool air directly to your graphics cards. Inside, there's room for up to five fans and the four combination hard drive/SSD trays make storage installation and upgrades quick and easy. Cable routing cutouts help you reduce clutter and the built-in dust filters help protect your components. Up front, the USB 3.0 connector gets you up to speed with the latest high-performance storage devices. Huge side panel window. The large side panel window lets you show it off.LED front intake fan, with room for more. The 120 mm front intake fan is bathed in soft LED lighting and it's oriented to draw cool air directly across your graphics cards. And if you want even more ventilation, you can add a second 120 mm fan or even dual 140 mm fans. Flexible cooling potential. It is designed for cooling, so you're covered if you're overclocking, running multiple GPUs or if you just want more airflow. 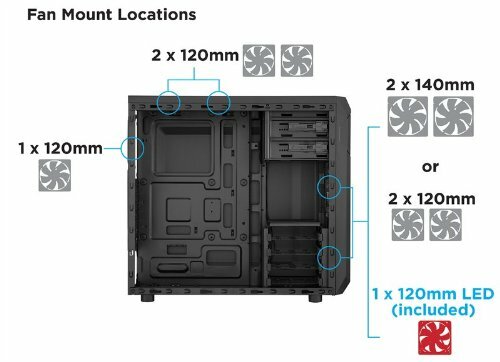 There are mounting points for up to five fans, including dual front 140 mm or 120 mm fans, dual 120 mm fans on top and a rear 120 mm fan.It has multiple drive bays. In addition to the two standard 5.25-inches optical drive bays, there are four built-in 3.5-inches / 2.5-inches combo drive bays for mechanical hard drives or solid-state drives. Builds should be easy. 3.5-inches drive installation is tool-free and you get cable routing holes for neater-looking builds and better airflow. And, there's a CPU cutout to allow for cooling upgrades without removing the motherboard. The front intake fan filters help keep dust out of the interior and the front panel has a USB 3.0 port for fast performance from USB flash drives and portable hard drives.